Address: 1597 State Route 97, Butler , OH. 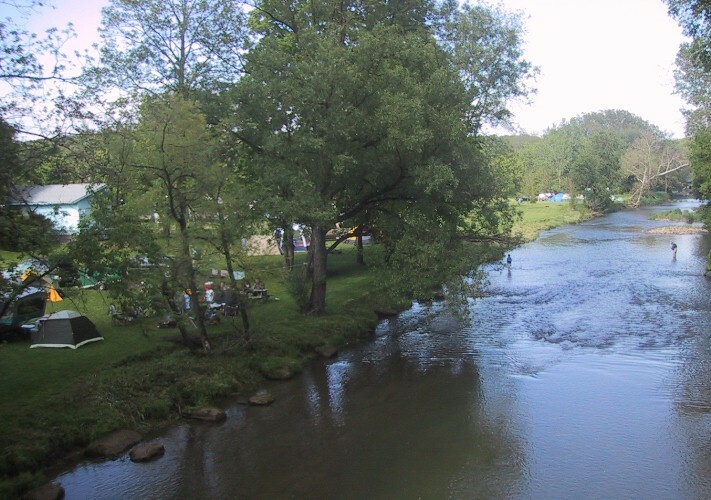 Mohican State Park is over 6,000 acres of beautiful countryside. The park offers many recreational activities including hiking, canoeing, swimming, nature study, picnicking, backpacking, hiking, horseback riding, and fishing. Over twelve miles of trails take the visitor to the more interesting areas of the park and forest. Lyons Falls trail follows Clear Fork Gorge (the largest gorge in the State of Ohio) and features two waterfalls. The Hemlock trail leads to the scenic wooden bridge, and Pleasant Hill trail follows the lake shoreline and offers beautiful views of the lake. Other trails are available in the adjacent state forest for equestrians as well as hikers. 18 miles of paved bike trail allows you to ride, or walk, in this beautiful countryside. The Mansfield Reformatory is an historic prison, and also the site of 3 major motion pictures including the Shawshank Redemption, Air Force One and Tango and Cash. Guided Tours are available. Including Haunted Prison tours in October! Located at "Prairietown" this popular Old-West arts and crafts festival is held annually just minutes from River Trail Crossing in Butler, Ohio. Traditional craftsmen in an outdoor setting featuring Old West theme, pioneer foods, family entertainment. One of Ohio's premier race tracks, Mid-Ohio, is a short drive from River Trail Crossing. Mid-Ohio hosts various racing events all season including the Honda Super Cycle Weekend, the Vintage Grand Prix of Mid-Ohio and the National Auto Sport Association Championship. Malabar Farm in nearby Pleasant Valley was the home of Pulitzer Prize-winning author, Louis Bromfield. The outbuildings and pastures still house chickens, goats and beef cattle. The hills are ribboned with strips of corn, wheat, oats and hay while the scenic trails are adorned with nature's bounty. Wagon tours are available May through October. Wax museum offering two tours, Old Testament and New Testament. Also on display are rare Bibles, woodcarvings, American votive folk art, and Christian Dinner Theater. The Ohio Bird Sanctuary is located on the headwater of the Clearfork River in Mansfield, Ohio. The marsh and old growth forest offers great birding and hiking opportunities. Enjoy seeing birds up close at the birds of prey display or by walking through the songbird aviary. 40,000-volume genealogical library, primarily for Ohio family research, including census records, cemetery listings, Bible records, vertical files, manuscripts, newspapers, and lineage papers for First Families of Ohio, Society of Civil War Families of Ohio, and Settlers & Builders of Ohio.